Readings: Daniel 12: 1-3 –‘At that time Michael, the great prince, the protector of your people, shall arise. There shall be a time of anguish, such as has never occurred since nations first came into existence. But at that time your people shall be delivered, everyone who is found written in the book. Many of those who sleep in the dust of the earth shall awake, some to everlasting life, and some to shame and everlasting contempt. Those who are wise shall shine like the brightness of the sky, and those who lead many to righteousness, like the stars for ever and ever. Mark 13:1-8 – As he came out of the temple, one of his disciples said to him, ‘Look, Teacher, what large stones and what large buildings!’ Then Jesus asked him, ‘Do you see these great buildings? Not one stone will be left here upon another; all will be thrown down.’ When he was sitting on the Mount of Olives opposite the temple, Peter, James, John, and Andrew asked him privately, ‘Tell us, when will this be, and what will be the sign that all these things are about to be accomplished?’ Then Jesus began to say to them, ‘Beware that no one leads you astray. Many will come in my name and say, “I am he!”and they will lead many astray. When you hear of wars and rumours of wars, do not be alarmed; this must take place, but the end is still to come. For nation will rise against nation, and kingdom against kingdom; there will be earthquakes in various places; there will be famines. This is but the beginning of the birth pangs. May the words of my mouth and the meditations of my heart be acceptable in your sight. War and rumours of war – Today’s reading from the gospel is poignant in the face of recent events in Israel/Palestine. 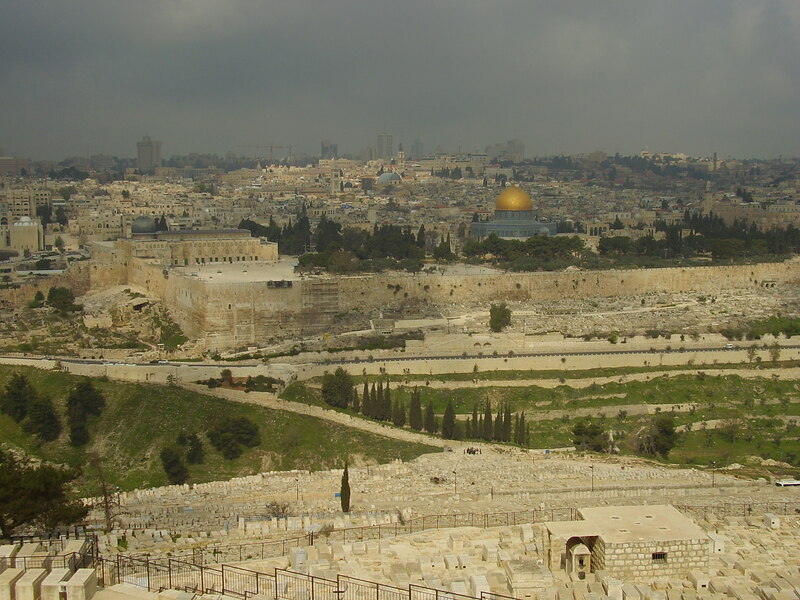 We see Jesus sitting on the Mount of Olives considering the future. The current escalation of tensions may not come as a surprise, and for some there may be surprise that there had been a period of relative peace. We are used to hearing of conflict, tension and bombings coming from the Middle East. Of course the core of all conflict throughout the area is that of the conflict between Arabs – Christian and Muslim, and Jewish Israelis. Analysts describe the recent attacks from Israel on Gaza as part of a pattern of behaviour that always takes place prior to elections – the next being held in January. There are reports the assassinated Hamas leader had negotiated a peace agreement and his killing took place on the eve of the announcement of that agreement. So just as some peace was in sight, electoral power took precedent – and once again the people are lead astray. Wars and rumours of war, nation will rise against nation, kingdom against kingdom, the people will be led astray. When I was in Israel several years ago, I attended the national commemoration of the Shoah, of the Holocaust. The rhetoric was one of ‘never again’ – never again would the Jewish people suffer from ethnic cleansing, suffer from another holocaust. Every measure of security must be taken in order that suffering should happen never again. It struck me this was the articulation of a victim – someone who had suffered greatly and was determined to never have to go through that suffering again. This is a nation which has suffered greatly, not one family does not have someone in their ancestry who was lost in that great human suffering of the Holocaust. That there is an all-pervading fear is understandable. To be sympathetic to that suffering is part of the human calling to compassion. But it also occurred to me that just as a victim understandably feels the need to protect themselves – there are many steps towards healing that must follow if that victim is to thrive. If you say never again, you will do everything in your power to set up walls of protection around yourself. Sometimes these are emotional and psychological walls, sometimes they are walls of weapons and attack, and sometimes they are literal walls such as the wall Israel has built between the Jewish, Israeli settlements and the Israeli-Palestinians living among them. The psychological walls are the most perfidious – they are the ones that don’t allow us to open ourselves emotionally to anyone else, where we can live in a bubble of fear and enmity, that believes everyone out there is an enemy and out to hurt or even kill. I was privileged to get to know a group of Jewish women in Sussex who had gotten together because they had grown up in that generation following the war in Europe, the children of Jews who had escaped the Holocaust. They weren’t taught anything about their own religious traditions – their parents fearful of them talking in school about their Jewishness, their traditions were eliminated from their upbringing. They knew nothing other than they couldn’t talk about who they were. So they formed a group of friends to study something of their Jewish customs, of their religious traditions. And slowly, gradually, they opened up to others, to me and to a motley collection of Christian and secular women. Their openness was courageous. For theirs is a culture that feels in its bones that it could face slaughter at any moment. And yet at the Holocaust museum in Yad Vashem, in Jerusalem, there are memorials dedicated to those non-Jews who had given their lives to save others. None of us survives without the help of those around us, those who will courageously not stand oppression, those who will speak a dignified word of courageous Love in the face of such oppression. None of us stands alone. And this is what is so sad about the current situation in Israel/Palestine today. Israel seeks to stand alone against the world, and especially against its neighbours. That next courageous step that says I will trust, I will trust even though I am afraid, I will trust – that stage of healing has still not been reached. It is a stage of faith. Now I know it is easy to say, you have to have faith to survive. What about the faith of all those who perished in concentration camps? What good did their faith do for them? Horrific events happen every day, happen to good people, happen to the best people, happen to the innocent as well as the guilty. But what makes the difference is the courage to stand again, to trust again, to learn to love one another again. This is what reconciliation is about, this is what confession is about, this is what facing one’s own sin is about. Forgiveness is found in our forgiveness of ourselves and in our forgiveness of those who have hurt us the most. The passage just following today’s gospel speaks of being arrested and taken before the courts, of being beaten and life threatened. But Jesus tells his apostles, tells us, that is the time to speak of the good news, to allow the Holy Spirit to give voice to the Love God holds for us all – even when we face the worst, even when we commit the worst. God is with us, and loving us, saint and sinner, all the same. Peace will only come when we see we are all both, one in the same – saint and sinner, victim and perpetrator, when we can stand before the courts of public opinion and outrage, and declare God’s love. Jesus speaks of war and earthquake and famine as birth pangs – the pain that comes before new life is brought into the world. One day, there will be new life in the Middle East. One day there will be peace.